Known by many names—"Father Christmas" in England, "Papa Noel" in Argentina, and "Weihnachtsmann" in Germany—Santa Claus is being tracked by NORAD around the world...as I type! Many, many children are hopeful, as am I, that he and his reindeer stop in Atlanta. Before he started circumnavigating of the globe—which he does in a single night, nonetheless—Saint Nick was at the Atlanta Botanical Garden for a visit with kiddies and families, now a Garden tradition of more than a decade. He shared with some of the kids his name variations in the different countries he visits, and they listened quite attentively, a favor he returned when they shared their Christmas gift wish lists. I've had the pleasure of meeting and talking with Saint Nick during more than one holiday season and I have to say...he's awesome! And he's brilliant with the kids...even the hesitant ones. A "gimme a high five" or a "are you a princess" and they're quick friends, anxious to share with him what they hope to be gifted for Christmas. Saint Nick has made photos with visitors in various parts of the Garden over the years. When regaling his years of visits to the Garden, he recalled the Chihuly in the Garden exhibition back in 2004. For at least the last couple of years, he's visited with families in the Fuqua Orchid Center. This year's Poinsettia Tree, located in the Orchid Center, is yet another spectacle of holiday gorgeousness! This one, the backdrop for this years photos with Saint Nick, was made with a total of 500 plants—230 Jubilee Pink Poinsettia and 270 Dracaena Lemon Lime! At the base are more pink and green plants and flowers, including a smattering of pure white Amaryllis. 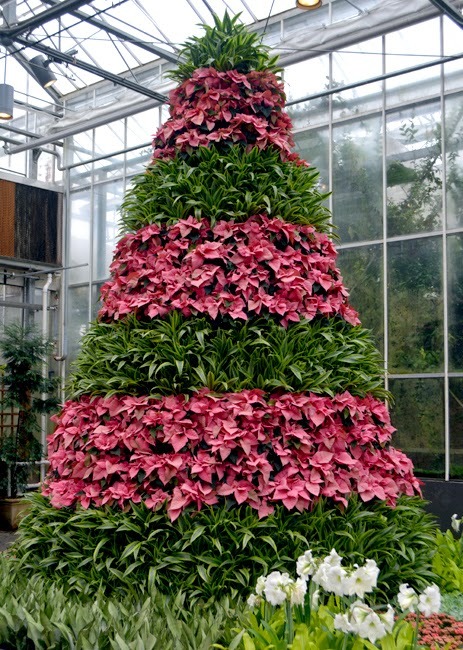 Learn more about the creation of the Poinsettia Tree in The Orchid Column, authored by Fuqua Orchid Center Manager Becky Brinkman. 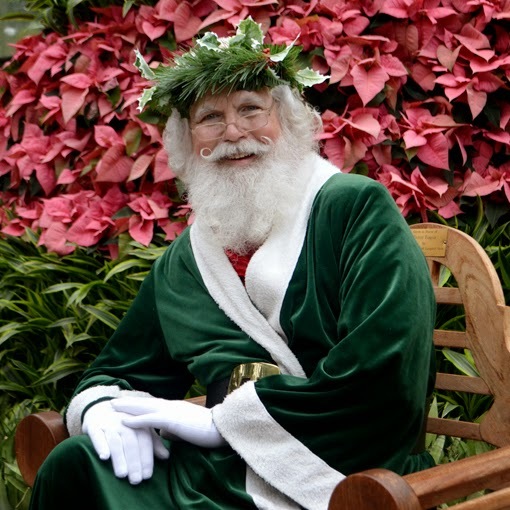 If you've not met Saint Nick at the Atlanta Botanical Garden, keep an eye out for next year's holiday events listing on their website. Oh, and photos with Saint Nick—which a Garden volunteer is happy to make with your own camera—are free with Garden admission. Ho, Ho, Ho and Happy Holidays, Everyone! Dinosaurs have invaded Atlantic Station!